The Beauty Chain now offers a range of specialist aesthetic treatments carried out by fully qualified staff. Please have an idea of your availability as our specialist treatments will require booking in advance. Dermal Fillers are designed to replace the loss of natural collagen which shapes and supports the skin. They 'fill out' and smooth away troublesome lines, wrinkles and hollows, recreating the smoother contours of youthful skin without any need for surgery and stimulates the production of collagen. The rejuvenation process is visible almost immediately after injection and lasting 4-12 months dependent upon the individual. Areas that can be treated include nasal labial and marionette lines, smoker's lines, full or partial lip enhancements (including dental blocking for a pain free experience), décolletage and the backs of hands. For both men and women this is a safe, quick and straight forward treatments that can be supplemented by other treatments such as dermal fillers leading to an even better aesthetic result. The treatment is used in the management of fine lines, age lines and wrinkles to promote a more youthful appearance. 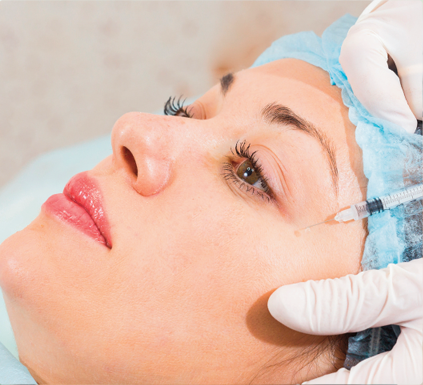 Botulinium A Toxins treatments are given by injection and help relax the underlying muscle, smoothing skin and reducing wrinkles. The results of this treatment can last up to 4 months. The treatment works by relaxing muscles which contract to cause facial lines. Deeper and more permanent creases and lines may need a Dermal Filler. Botulinium A Toxin injection can also be used to reduce sweating (hyperhidrosis). Although this is a natural phenomenon necessary for the regulation of an individual's body-temperature, unfortunately, some people sweat far more than is necessary. Our Aesthetics Consultant will advise you on which treatment is best for you dependent upon your skin, your requirements and cost considerations.